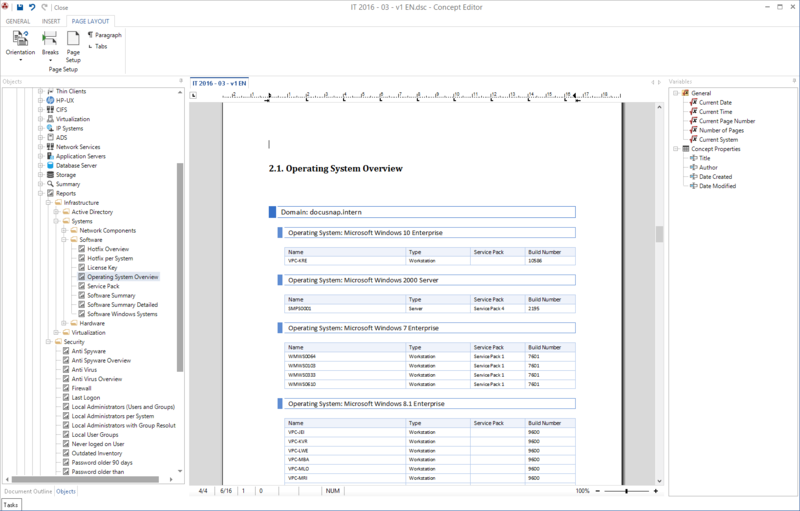 Most documents created in a computing environment are text documents or documents containing integrated tables, graphics, or diagrams. For all certifications and standards (e.g. ISO 27001, ISO 20000) and process frameworks (e.g. ITIL), specific concepts must be created which also include data from current documentation sets. Usually, you create your concepts in a text processor and populate them manually with the documentation data available at this particular time. These technical data is typically determined by an inventory system and stored in a Configuration Management Database (CMDB). Transferring such data manually into a concept is extremely time-consuming, and updating the concepts with the current data is accordingly tedious and error-prone. By inventorying the relevant data and providing a CMDB, Docusnap provides a useful basis for your conceptual work. And as a special highlight, you can create your concepts directly in Docusnap and directly access the data stored in the CMDB. This means that there is no need to do this work in a text processor. 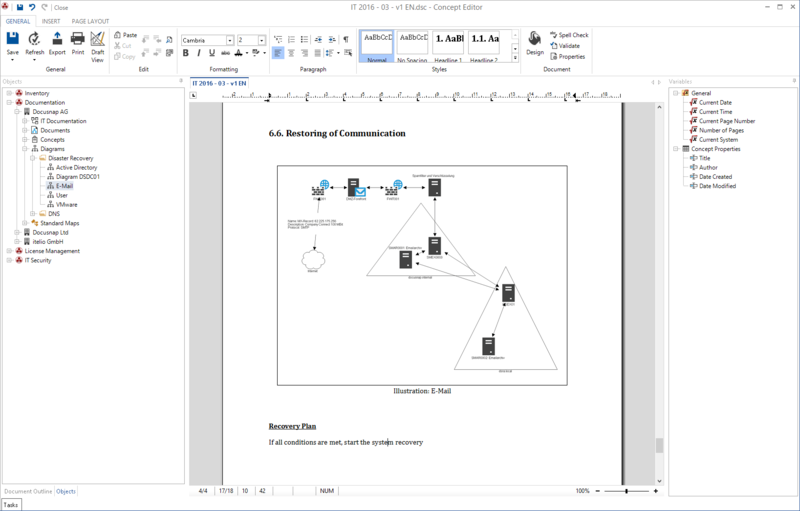 The advantage of this method is obvious: All data, diagrams, visualizations, plans, and evaluations from the Docusnap CMDB can be linked directly to the concept. 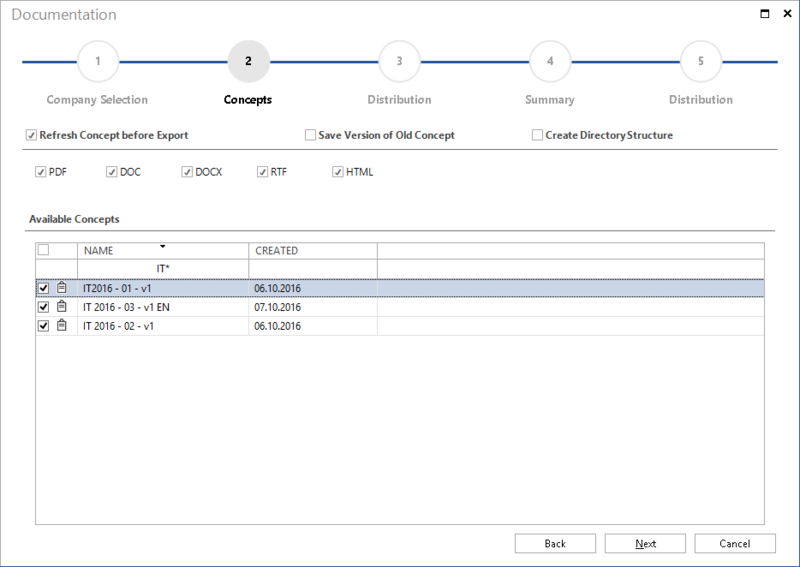 The contents of the concepts created in Docusnap will be updated automatically based on the latest inventory scan if the scan results reveal changed datasets in the CMDB. 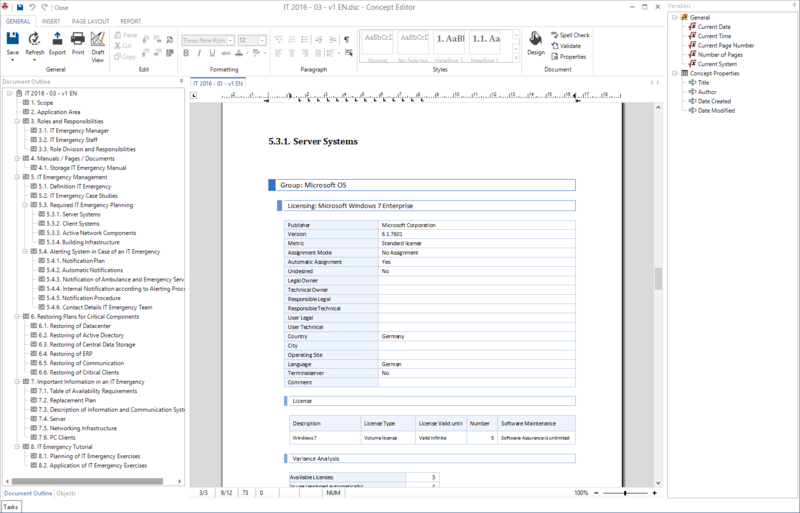 You can integrate reports, plans, dynamic data lists, IT relations, and external documents into an IT concept, but it is also possible to embed the output from other software programs. Filters and parameters allow you to perfectly fine-tune the integrated data within a concept. 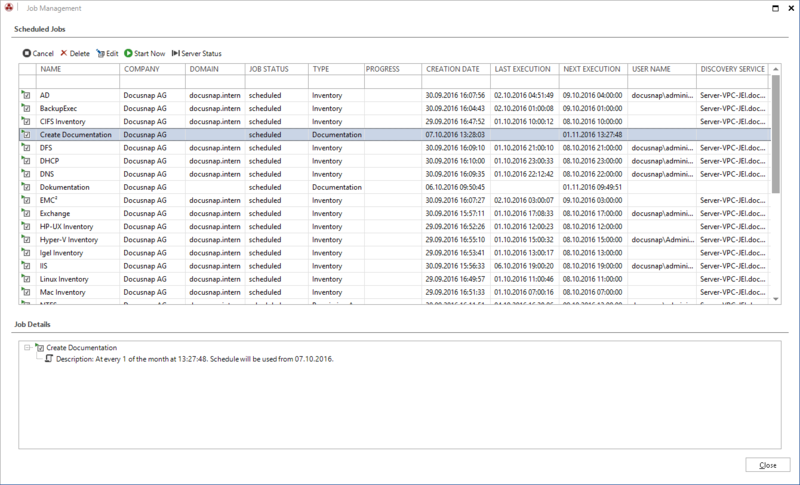 In addition, variables can be used within normal text blocks to serve as placeholders for data from the CMDB. You can schedule the creation of concepts for a certain date and time and thus automate it. Generating concepts is possible in a broad range of output formats, such as PDF, Microsoft Word, HTML, etc. Then, the generated document can automatically be sent to the specified recipient by e-mail. It is possible to configure a specific designs for each tenant based on the respective CI. Thus, the output format is always in line with the individual standards of each tenant or company (customer, subsidiary, branch office, etc.). Docusnap provides a variety of concept templates. 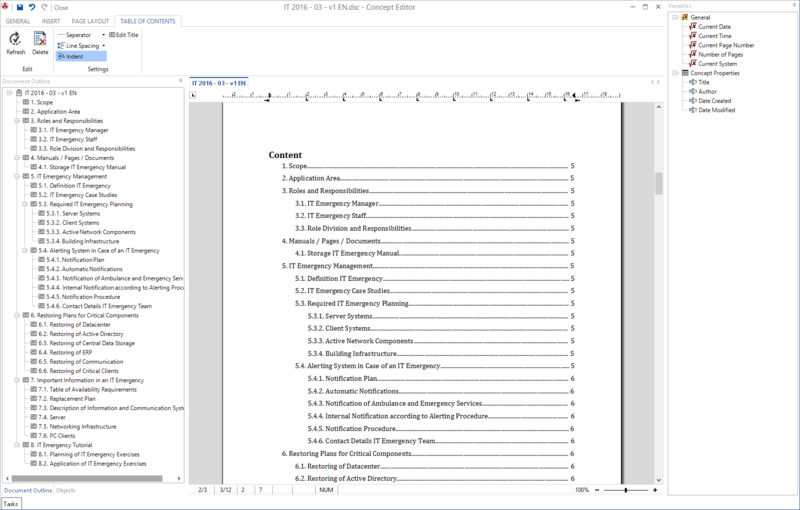 Using these predefined, customizable templates greatly simplifies the creation of emergency plans, operating manuals and other documents pertaining to your computing environment. Finally, you can easily and individually create additional concept templates at any time.